ms Sapphire, which joined the Tauck fleet in 2008, is full of little surprises. The ship, which underwent a substantial renovation ahead of the 2017 cruise season, is filled with modern amenities and extras normally associated with coastal cruise ships. 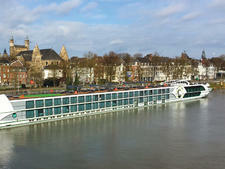 All cabins face the outside (most have French balconies). Amenities include flat-screen televisions with on-demand programming, Molton Brown toiletries and cushy bathrobes. 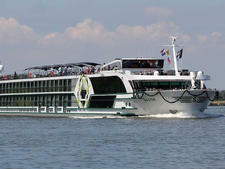 Complimentary Wi-Fi is available from bow to stern. An alternative dining option, called Arthur's, is available from early afternoon until late at night and features a 180-degree retractable glass wall for added ambiance. 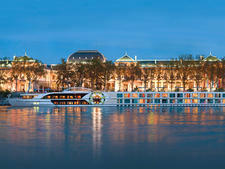 Then, there's the unusual variety of itineraries offered on the Rhone, Seine and Saone. 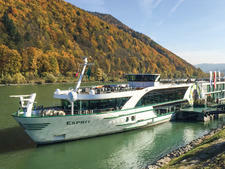 Sapphire, which never leaves Europe, covers many of the stalwart river routes, including a round trip cruise from Paris that visits Rouen and the beaches of Normandy, with opportunities to explore metropolitan cities as well as idyllic villages, on your own or with the group. 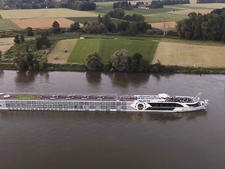 Passengers can even borrow bicycles to ride along the river on some itineraries, meeting up with the boat at the next port of call. Depending on the trip you choose, the cruise experience can be almost like a land tour during which your boat is simply your floating hotel. Indeed, the company, founded in 1925, specializes in land-based touring and has been offering guided trips across the globe for decades. One final surprise: If Sapphire sails at a bit of a languorous pace, the rest of the experience doesn't necessarily feel as laid-back. Between tour-packed days in port, there are lectures (we had a lesson in the Cyrillic alphabet), shore tours, cocktail parties and, of course, meals. Tauck's core river boat audience is well-traveled and well-heeled, in the 55-plus age range. A good number of the travelers on our sailing were repeat Tauck customers (though many were trying the river boat experience for the first time, having done only the company's land tours). 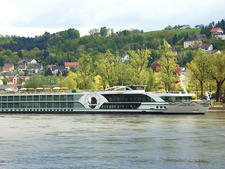 Those with prior cruise experience had generally sailed on luxury lines such as Seabourn, Silversea Cruises and Crystal Cruises, or with other river operators, such as Viking River Cruises. 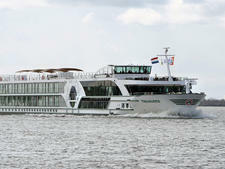 Cruise Critic’s professional photographers and our extraordinary community members have taken 562 pictures of ms Sapphire. When you visit our photo galleries, you can be assured that what you see is what you get. Casual attire prevails. During the day, men and women both wear light pants or jeans with layers on top for transitioning between varying climates (cool, breezy mornings lead very quickly into scorching afternoons). At dinner, men generally wear dress pants and button down or smart polo shirts, with women in pants or skirts with blouses or light sweaters. Dressier attire -- dresses or pants suits, but not fancy gowns, for women and a jacket and tie for men -- was donned only at the farewell candlelit dinner on the last night of our cruise. 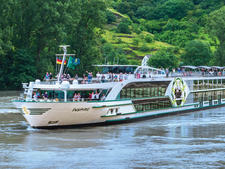 Tips are not expected as Tauck's tour prices include gratuities for ship staff (and hotel staff if there's a land stay), local guides, drivers, Tauck directors and the cruise director. If you'd like to give a little extra -- say, to an excellent bartender or to the massage therapist onboard -- be sure to carry some cash as you won't be able to charge it to your onboard account. The onboard currency is the euro.